Minecraft Fluxx is a variant on Fluxx I created. Both a print-and-play and a tabletop simulator version are available. It's ready to be played, but also a work in progress. Feedback is appreciated. Fluxx is a fun, fast-paced, easy to learn card game for 2-6 players created by the genius Andrew Looney and published by Looney Labs. If you have not played Fluxx, you should buy a copy first. There's lots of different types to choose from. My favourite is Pirate Fluxx. This is a fan created variant, which is not intended to be a replacement for the original games. 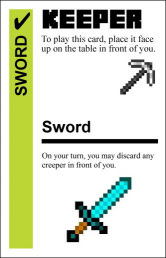 You can also use Fluxx Blanxx to create versions of these cards that can be combined with existing Fluxx cards. Minecraft is a hit sandbox computer game that has sold over 70 million copies. If you haven't heard of it, you may have been living under a rock. 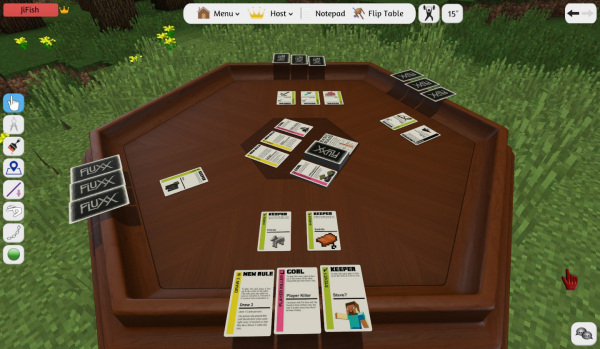 Tabletop Simulator is a cross-platform game that allows players to play and create tabletop games in a multiplayer physics sandbox. It's a great tool for playing games like this online. It's available to buy on steam. An 8-Bit Adventure a comedy Dungeons & Dragons Module. If you enjoyed this fluxx variant, I'd love to hear from you. Drop me a note: mcfluxx@jifish.co.uk or send me a tweet @JiFish. This game is a fan creation. It is not intended for any commercial use.